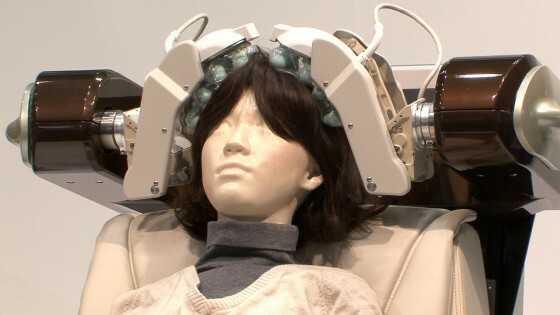 Panasonic has developed a prototype dry head spa robot, which in the future could be attached to a desk or bath. It uses robot hand technology previously developed for use in their hair washing robot. To start the dry head spa, you first adjust the head fitting, and record your hairline position. Then, the robot hand applies slight pressure to recover a 3D scan of your head. A 3D tracking mechanism enables the 24 fingers to follow the shape of your head automatically, with the arms expanding and contracting, to make sure they reach the center of your scalp. As well as gently kneading your scalp, this machine can be used in conjunction with a massage chair to give a full-body experience.